✔ The Thames and Kosmos Tk2 microscope is a powerful microscope. 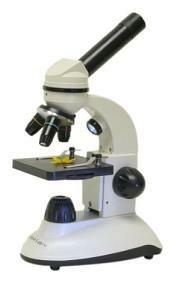 ✔ The microscope includes 20 accessories. ✔ Manual with instructions on how to use a microscope. ✔ Gets children interested in biology and science. Microscopes are a great way to get interested in biology and science. Children can use them to observe insects, leaves, rocks, pond water, bacteria and various micro-organisms, which gets them curious about all things related to biology, chemistry and science. Getting a good quality microscope is key. If the microscope is not good enough (for example, if it has a low magnification), it becomes merely toy that becomes quickly boring, especially if your kid has reached middle school / high school age. Unfortunately, many of the beginner's microscopes are poor quality and merely toys. A good beginner's microscope should have good optics and good magnification. With a high magnification microscope, children can look at smaller specimen (which can make the experience of using a microscope really fascinating). A good beginner's microscope should have a built-in light source, should operate smoothly and should have accessories such as slides. The Thames and Kosmos Tk2 Microscope has all of these qualities. It is easy for a kid to use but it does not mean that it is not a real microscope. It is powerful, with a magnification of 400x! It was two built-in light sources, one above and one below the specimen. It comes with 20 accessories including prepared slides as well as blank slides. Also included are a lens tissue, coverslips, tweezers, petri dish, a pipet, a scalpel and dissecting needle. It comes with an illustrated 49 page experiment book containing instructions and experiments that kids can perform. Very useful especially for beginners who don't know how to use a microscope and how to run experiments. If the provided experiment book is not enough, you can purchase a book with microscope activities. There are many that you can find online or at bookstores. We also recommend that you take a look at our microscope for kids page where we explain how to choose a microscope. And for games and toys related to science, visit our science toys guide.